What Contributes to Your Company’s Carbon Footprint? If you would like to make your company more eco friendly in the coming year, you may want to take all of the steps that are needed to reduce your carbon footprint. 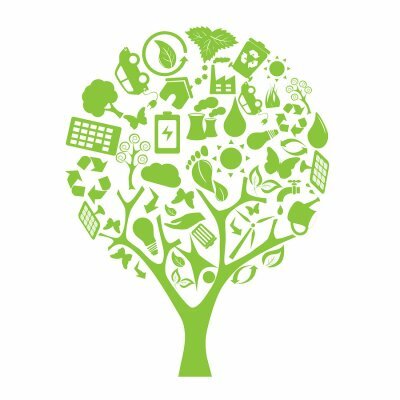 With proper waste management and recycling practices, you can ensure that your business is not contributing to environmental problems. A company that offers trash removal in Atlanta can help you design a waste management strategy that will help you improve the environmental impact of your company. To help you ensure that your business is eco friendly, here is a look at some factors that may contribute to your company’s carbon footprint. A typical business creates a significant amount of paper waste throughout the course of the week. When you have extra print outs, files, or other paper products, you can help to reduce your carbon footprint by recycling these items, rather than tossing them in the trash. To improve your carbon footprint even further, you can also encourage your workers to correspond electronically, rather than through paper memos. Commercial buildings that contain many office spaces and conference rooms can consume a large amount of electricity in a single day. To decrease the carbon footprint of your company, it is a terrific idea to evaluate your electrical usage. Switching to high efficiency appliances and lighting can help to cut back on your electrical consumption. You may also want to schedule an energy audit for your building so that you can identify potential sources of energy loss. When you find that you are tossing out large amounts of waste at the end of the day, you may start to get concerned about the carbon footprint of your company. In order to improve your carbon footprint, you will want to figure out how to recycle as much of your waste as possible. Recycling paper waste, metals, and old electronics can help to make your company friendlier to the environment. What Happens to Recycled Electronics? While your old electronic items may seem like they are no longer useful, these devices are actually very valuable after they have been processed at the recycling center. In this video from Recycle Now, you will learn about what happens to electronics after they are sent to a recycling center. A facility that specializes in scrap metal recycling in Atlanta will process your recycled electronics with the utmost care. Once your electronics have been placed in the recycling bin, they will be sent to a processing plant to be carefully recycled. In order to recycle electronic waste , a plant must first shred the old electronics. The shredded material is then carefully processed by the recycling center. Pieces of metal, plastic, and glass are then sorted and transformed into brand new items. What Is Single Stream Recycling? As you are planning a waste management strategy for your business, you may want to inquire about the benefits of single stream recycling . Unlike conventional recycling methods, which require the user to sort various materials, single stream recycling allows various types of materials to be recycled in a single bin. Single stream recycling offers the same advantages of paper, plastic, and metal recycling, but with none of the hassle. When you recycle near Atlanta, a single stream approach may be suited for your needs. After you have set up single stream recycling for your business, you will be able to eliminate any confusing or bulky recycling materials that require you to sort and separate materials. Single stream recycling is particularly effective for office environments, where it can be difficult to ensure that every employee is practicing proper waste management strategies. Your waste management company can answer any additional questions that you may have about the single stream method. When you implement a recycling program for your home or commercial office, chances are that you will be recycling a significant amount of paper products. Designated recycling bins will help you separate paper goods from other recyclables, such as plastics or metals. 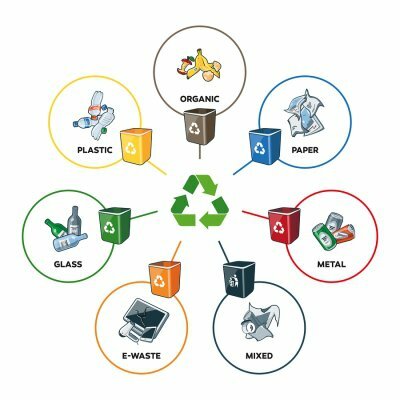 If you are planning to recycle near Atlanta , it is a terrific idea to gather information about various types of paper products and how they can be recycled. 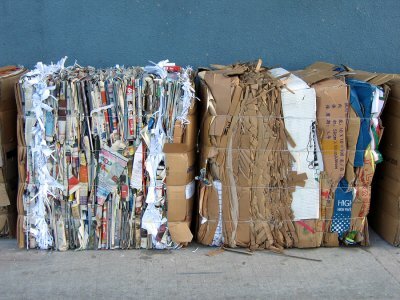 To help you gear up for your new waste management plan, read on for an overview of the different classifications for paper and cardboard recycling. The term OCC stands for Old Corrugated Containers, and corrugated cardboard is among the most commonly recycled paper products. You can identify whether you are recycling OCC by looking at its material composition. Typically, OCC is distinguished by its ridged surface, which is housed between two flat pieces of cardboard. OCC can be recycled and transformed into a variety of other materials, including postal boxes, paper bags, and more. When you have old issues of the newspaper on hand, you will need to figure out how to recycle your ONP, or Old Newspaper. A newspaper is only classified as ONP after it has been distributed to a home or business client for review. When ONP is recycled, it can be transformed into many different types of useful products, including paperboard, tissue, and art paper. In order to process ONP, your recycling center may need to send this material to a special paper mill. Business offices and other commercial settings often create large quantities of high-grade paper waste. Some examples of high-grade paper include letterhead, stationary, and business documents. Before high-grade paper can be transformed into new products, it must be sent through a deinking procedure. Removing the ink allows the recycler to process the paper, without having to deal with color inconsistences or variations. Whenever you implement a new waste management strategy for your company, it can be tough to ensure that all of your workers are on board with your plan. However, a company that specializes in recycling serving Atlanta will be able to help you plan smart strategies that will help all of your workers reduce their overall waste. After you have placed recycling bins throughout your office, it will be up to you to make sure that they are used properly. Here is a look at some tips that will help you encourage your workers to reduce, reuse, and recycle. One of the best ways to encourage your employees to reduce their waste production is to make sure that your business waste policies are clearly outlined for all of your workers. If you will be embarking on a new recycling program, you may want to send out a company wide memo that details the specifics of how to recycle in the workplace. By arming your workers with information about recycling, you can help them cut back on their waste. Many businesses generate large amounts of paper waste throughout the course of a workday. Rather than having your employees print out all of their notes and correspondences, you may want to create a system that allows them to communicate electronically. Email servers, cloud computing, and other forms of technology have made it easier than ever to reduce the amount of paper waste that is generated in an office setting. If your workers are unaware of how to correctly recycle their waste, they will have trouble following your waste management strategy. Once you have placed recycling bins around your office, you will want to clearly label them with their correct contents. For example, if a bin can only accept paper waste, you will want to label it with this information. When you have an old or outdated computer, cell phone or other electronic device on your hands, you will want to recycle your device, rather than toss it in the dumpster. 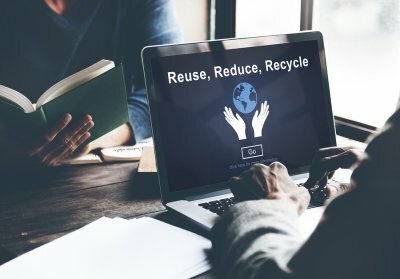 With assistance from a facility that specializes in recycling serving Atlanta, you can ensure that your e-waste is properly processed after it is no longer functional. In order to properly recycle electronic waste , it is necessary to use special waste disposal methods. Let’s review the processes that are used to recycle old electronic items. The first step of recycling an electronic item is to bring it to the electronics recycling center. If you simply toss your electronic device in the trash, it will immediately go to the landfill. To determine whether you are recycling your electronic items properly, you may want to consult with a waste management company in your local area. Your waste management professionals can tell you precisely where you need to bring your electronics so that they can be properly processed and recycled. Once an electronic item, such as a computer, has been sent to the recycling facility, it will be sent to a powerful shredding machine. The shredder uses its durable teeth to tear apart the solid electronic device and turn it into lightweight particles. Certain electronic components, such as batteries, may need to be removed before the shredding process takes place. The final step of electronic recycling is to sort all of the various materials that have been shredded. In order to make sure that the materials are properly organized, a recycling facility may use a state of the art optical sorter. The optical sorter can identify the composition of each particle, and place each type of material into a specific bin. Once the shredded materials have been sorted, they will be ready to be transformed into new electronic products. Paper products surround us throughout our days, and we may not think about what happens to paper after it is tossed in the recycling bin. In this video, you will take a look at some amazing recycling facts about paper. In the past 26 years, the United States alone has recycled 1 billion tons of paper. 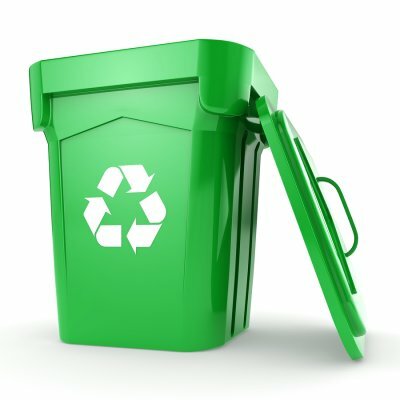 When you purchase recycling bins in Atlanta, you can rest assured that your waste management company will send your paper goods to the correct recycling facility. A recycling company will bring your paper waste to a mill for processing. At the mill, the paper will be shredded into a product that is known as pulp. Next, this pulp will be sent to the recycling center so that it can be transformed into new paper items. When you purchase a paper item, chances are that it has been manufactured from recycled consumer waste. A green initiative is a program with the primary purpose of reducing greenhouse gas emissions. If you’re hoping to make your office more environmentally friendly and improve how it handles waste management in Atlanta, then there are several steps that you can take. 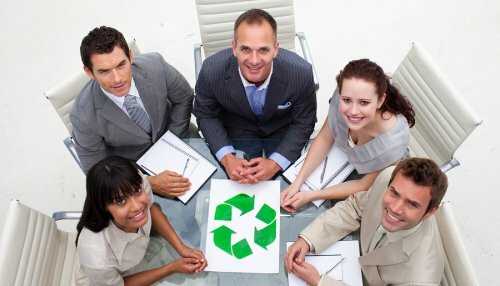 First, implementing a recycling program is an excellent green initiative to introduce to your office. Start by contacting your local waste management center about beginning a recycling program and placing recycling bins for paper, glass, plastic, and metal in your office. Next, educate your team about what should or shouldn’t go in the bins and the benefits of recycling. Also, there are several simple green initiatives that you can introduce to your office. For example, having plants like palms, ferns, and orchids can improve the aesthetics and morale of your office while at the same time offsetting CO2 emissions and volatile organic compounds (VOCs). Finally, installing energy-efficient lighting, turning off electronics that aren’t in use, and reusing paper are all excellent ways to promote a greener office.